Welcome to the Syracuse City School District Green Team website! The goal of the Green SCSD is to reduce the amount of energy consumed and waste produced within the SCSD. Twelve of the thirty-six schools have an established and active Green Team. The students and staff who participate in the Green Team program educate the school community on energy conservation and recycling. Green SCSD was born from the school district’s desire to incorporate environmentally themed initiatives within the school day at each grade level throughout all of the city’s schools. Green SCSD is a collaboration between the Syracuse City School District, the National Energy Education Development Project (NEED) and Energy Training Solutions (ETS). Students and teachers are learning how energy use impacts the environment, and how to achieve energy savings at their schools and their homes. In some schools, students are collecting recyclables on a daily basis and monitoring the recycling behaviors in their buildings. The program integrates inquiry-based science, mathematics, and language arts classroom instruction to provide students with a real-world learning experience that corresponds to state and national learning standards. Students are using professional energy auditing equipment to learn about technologies and practices that save energy by conducting experiments and energy audits of their school buildings. After an energy analysis of the school has been conducted, students implement a school wide energy conservation campaign. As students make the connection between the local and global impacts of climate change and the use of energy in their schools and homes, their level of commitment to making positive choices for the environment will increase. Increase student and community knowledge about climate change and how energy use affects this issue. Improve teacher capacity to deliver hands-on, inquiry-based instruction related to energy and the environment. Increase student observational, analytical, and decision-making skills through project-based learning applied to the solving of an environmental problem. Decrease the Syracuse City School District’s and the community’s “carbon footprint” through the reduction of energy use by the widespread adoption of conservation behaviors. Lemoyne Elementary School: On Halloween, Lemoyne Elementary School executed a very creative energy conservation campaign. 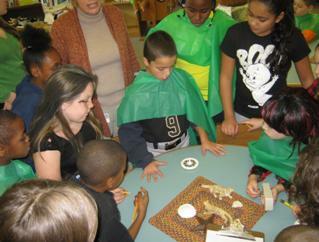 Students wore green capes and dressed up as vampires to educate the school community on wasting energy. “Vampire energy” is energy that is being consumed when electronic devices are plugged in but not in use. “Vampire energy” drains 10 billion dollars of energy from the grid each year in the U.S. alone. The Lemoyne “green vampires” visited each classroom to look for wasteful energy behaviors. Students used energy auditing kits (kilowatt meters) and did an analysis of how much energy certain technologies were consuming in the classroom. The green students did an excellent job educating Lemoyne students and staff to conserve energy by unplugging electronic devices when not in use. Keep up the good work!! !